According to Greek legend, Achilles fell in love with the Trojan princess Polyxena, the daughter of the king of Troy. He was offered her hand in marriage if he agreed to end the war between the Greeks and the Trojans. At Polyxena's request, Achilles came to make a sacrifice to Apollo, but he was ambushed by Paris, Polyxena's brother, as he knelt at the altar. Paris shot a fatal arrow into Achilles' heel, his one vulnerable spot. Before he died, Achilles vengefully proclaimed that the treacherous Polyxena be sacrificed at his tomb. Here Giovanni Battista Pittoni depicted the ghost of Achilles demanding that his bride be killed. Polyxena, wearing a white wedding gown, extends her arm toward the priest brandishing a knife and with great dignity steps forward toward the tomb. Around her, a throng of Greeks and Trojans watch with mixed emotions. Although a violent subject, Pittoni's elegant, richly garbed figures and elaborate antique architecture make an appealing picture of mythological martyrdom. Count Johann Matthias von der Schulenburg, 1661 - 1747 (Berlin, Germany; Venice, Italy), commissioned from the artist, about 1733/1734; by inheritance to his nephew, Adolph Friedrich von der Schulenberg, 1747. Antonio Morassi, Italian, 1893 - 1976, sold to Knoedler & Company and Pinakos, March 29, 1952. Source: GRI, Knoedler & Company records, stock book 10, p. 77, no. 4886. M. Knoedler & Co. (New York), 1846 - 2011 (New York, New York) and Pinakos Inc., sold to Walter P. Chrysler, August 1958. Source: GRI, Knoedler & Company records, sales book 18, p. 23, no. A-4886. Walter P. Chrysler, Jr., 1909 - 1988 (New York, New York), sold to Eugene Thaw, about 1972. Eugene Thaw, American, 1927 - 2018 (New York, New York), sold to the J. Paul Getty Museum, 1972. Robinson, Frederick B. "The Healing of Antiochus." Springfield Museum of Fine Arts Bulletin 26, no. 1 (October/November 1959), unpaginated. A Loan Exhibition of Venetian Paintings of the Eighteenth Century, exh. cat. (New York: Finch College Museum of Art, 1961), unpaginated, no. 34. Italian Renaissance and Baroque Paintings from the Collection of Walter P. Chrysler, Jr., exh. cat. (Norfolk: Norfolk Museum of Arts and Sciences, 1967), p. 67, no. 60. Binion, Alice. "From Schulenburg Gallery and Records." Burlington Magazine 112, no. 806 (May 1970), p. 301. Maxon, John, and Joseph Rishel, eds. Paintings in Italy in the Eighteenth Century, Rococo and Romanticism, exh. cat. (Minneapolis: Minneapolis Institute of Arts, 1970), p. 94, under no. 36. Baroque Masters from the J. Paul Getty Museum, exh. cat. (Northridge: California State University, 1973), pp. 24-25, no. 32, ill.
Fredericksen, Burton B., ed. 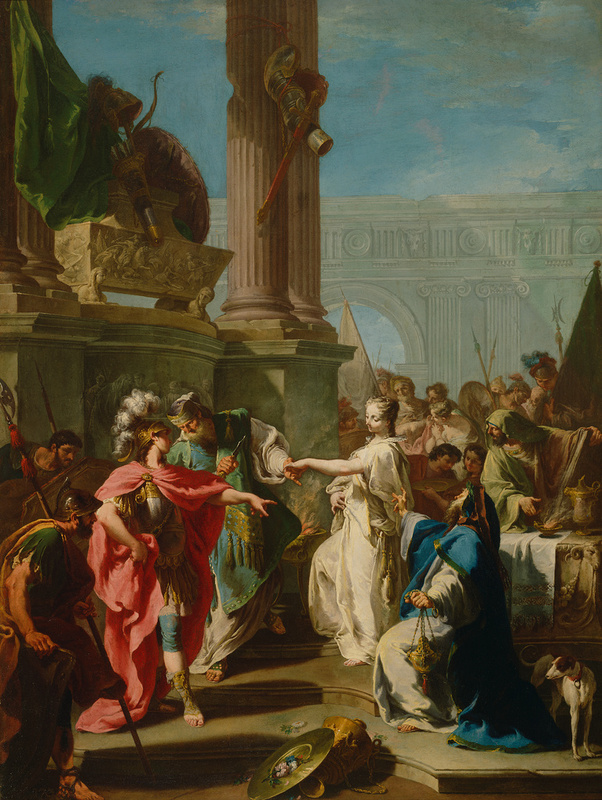 The J. Paul Getty Museum: Greek and Roman Antiquities, Western European Paintings, French Decorative Arts of the Eighteenth Century (Malibu: J. Paul Getty Museum, 1975), pp. 100-1, ill.
Fredericksen, Burton B., et al. Guidebook: The J. Paul Getty Museum. 3rd ed. (Malibu: J. Paul Getty Museum, 1976), p. 69. Boccazzi, Franca Zava. Pittoni, L'Opera Completa (Milan: Alfieri, 1979), pp. 139-40, no. 101; 160, under no. 185. Fredericksen, Burton B., Jiří Frel, and Gillian Wilson. The J. Paul Getty Museum Guidebook. 5th ed. (Malibu: J. Paul Getty Museum, 1980), p. 82. Binion, Alice. "Anton Kern in Venice." Müncher Jahrbuch der Bildenden Kunst, 3rd ser., 32 (1981), pp. 184, 205n54. Kalinowsky, K. "The theme 'Sacrifice of Polixen' in G.B. Pittoni's works." In Ars Auro Prior: Studia Joanni Bialostoki sexagenarío dicata (Warsaw: Państwowe Wydawnictwo Naukowe, 1981), pp. 537-42. Binion, Alice. I Disegni di Giambattista Pittoni (Florence: La Nuova Italia Editrice, 1983), pp. 24-26, 42, fig. 288. Binion, Alice. La Galleria scomparsa del maresciallo von der Schulenburg, un mecenate nella Venezia del Settecento (Milan: Electa, 1990), p. 88, fig. 25. Haskell, Francis. Mécènes et peintres: L'Art et la société au temps du baroque italien. Fabienne Durand-Bogaert, Andrée Lyotard-May, and Louis Evrard, trans. (Paris: Gallimard, 1991), pp. 571-72, fig. 124. Posner, Donald. "Pietro da Cortona, Pittoni, and the Plight of Polyxena." Art Bulletin 73, no. 3 (September 1991), pp. 399-414, fig. 14. Martineau, Jane, and Andrew Robison, eds. The Glory of Venice: Art in the Eighteenth Century, exh. cat. (London and New Haven: Royal Academy of Arts, with Yale University Press, 1994), pp. 133, 486, no. 57. Sciré, Giovanna Nepi, and Giandomenico Romanelli, eds. Splendori del Settecento veneziano (Milan: Electa, 1995), unpaginated, no. 148, ill.
Binion, Alice. "Giambattista Pittoni." Grove Dictionary of Art. Vol. 25, Pittoni-Raphael. Jane Turner, ed. (New York: Grove, 1996), p. 3, fig. 2. Torrini, Annalisa Perissa. Disegni di Giovan Battista Pittoni (Venice: Gallerie dell'Accademia, with Electa, 1998), p. 53, 149, under no. 27, figs. 39, 39a. Nooter, Sarah. "Tragedy, Sacrifice, and the Averted Gaze in 'The Sacrifice of Polyxena.'" In The Tragic Muse: Art and Emotion, 1700-1900, exh. cat. Anne Leonard et al., eds. (Chicago: Smart Museum of Art, 2011), pp. 51-52, fig. 28.